Tomatoes have been a mainstay of diets all over the world for centuries because of the many ways they can be prepared and the ease of growing them in sunny climates. When the tomato became domesticated isn’t known, but there is substantial evidence that it was grown and eaten extensively by prehistoric man. The wild tomatoes growing near human settlements were undoubtedly used as a staple food supply until the idea of plant cultivation began to spread. Once plant cultivation caught on, humans in South America, Central America and Mexico cultivated plants that grew small tomatoes and used them as a part of their staple diet. The Aztecs grew tomatoes and used them in many of their dishes, including an early form of salsa that was popular in the Aztec culture. Xitomatl, the Aztec word for the fruit, and tomati, the Central American Indian word for tomatoes have become combined to create the current word tomato. The Indians of the New World cultivated and grew tomatoes for centuries, using the fruit for its versatile nature and its high level of nutrition. The crop was one of the most important ones to the Indian cultures of the warmer regions. Historians do know that by the 15th century, tomatoes were widely grown by the New World Indians, and explorers entering the continent saw the tomato plants and the resulting fruit. Sometime during the late 15th century of early 16th century, European explorers to the New World imported the tomato to Europe and introduced it to the people back home. Whether it was Christopher Columbus, Cortez or one of the other European explorers who first brought back the tomato isn’t certain. What is certain is that by the mid-16th century, tomatoes were widespread in Italy and were being used in a number of dishes. In Peru, wild species of tomatoes grew in abundance, but there is little evidence that the plant was actually cultivated there before Columbus traveled to the New World. The tomato species that were brought back to the New World by the explorers can be studied by looking at the current descendants of those first plants that were introduced to Europe. Based on these descendants, the tomatoes that were brought back on European boats were very similar to the Mexican tomatoes species that had been cultivated for centuries rather than any of the wild tomato species that were found in South America. The genetic analysis of these cultivars has determined that these were the direct ancestors of the cultivated tomatoes that are grown today. This species, called cerasiforme, is still grown in Central America where it grows wild in some places to this day. That early, domesticated variety is a creeping vine that produces a small fruit that is bright red and round. These cherry tomatoes are a favorite of tomato fans who like the small tomatoes as garnishes and in salads. Based on the genetic study of those original cultivars and the wide difference between those tomatoes and the wild tomatoes growing in and around Peru, geneticists are reasonably certain that the cultivation of tomatoes began in Central America and then spread into Mexico and South America. When Cortez visited Tenochtitlan, the Aztec city that the explorer conquered, the tomato was a major crop that was eaten regularly. It is possible that one of the many spoils of conquering the site was the tomato plant. The city was conquered in 1521, and by 1544 the fruit was already being grown in Italy where it was called the golden apple. In the U.S., tomatoes were brought over to the New World with the European colonists. At that time, the fruit was used for medicinal reasons and as an ornamental plant rather than as a fruit or vegetable to be eaten at the table because of the prevailing negative feelings about it of the time. It was confused with a number of poisonous plants, including nightshade, and was associated with witchcraft in some cases because of that link. People who grew tomatoes at home often canned the fruit for use in the winger or to sell to neighbors. When U.S. and European cities became industrialized, the tomato was canned on a mass scale and made available to more domestic clients. As a warm-weather crop, the colder climates that weren’t acceptable for tomato production could purchase tomatoes in bulk and use them in a variety of dishes or as side dishes. With canning, the fruit began to soar in production to meet the needs of the new markets. The popularity of canned tomatoes led to both innovations in canning and juicing techniques needed to create more tomato products and in the number of cultivars that are bred. With whole tomatoes, sliced tomatoes, tomato paste and tomato sauce being canned, new types of tomatoes were needed that could provide the ideal specimens for those applications. New tomato cultivars include tomato varieties that have more solid material in order to make more paste for canning. 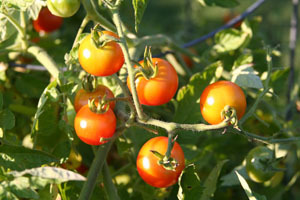 Roma, one of the most popular species today, is a high-solid tomato that is often grown in backyards and in containers because of its suitability for making tomato sauce. Like the modern cultivars, the earliest domesticators of the tomato were interested in having the most useful fruit possible form the plants that they cultivated. In the warm climates from South America to Mexico, tomatoes were grown as perennials and cultivated to produce plants that produced as many of the useful, nutritious fruit as possible. There may have also been some attempt to create larger fruit. The wild tomato species of South America are though to be the very first species to exist. These grew wild until they were transported at some point in prehistory up through the continent and into Central America where they were first domesticated. The earliest domestication efforts may very well have been accidental ones. Seeds were known to be traded across the continent, leading to the widespread cultivation of maize and other native vegetables. It is possible that tomatoes, a plant that was not being cultivated by the originators of the seeds, may have been spread at first with seeds that were naturally intermixed with other seeds. When those seeds were traded and sold, they may have been grown alongside the plants being cultivated in Central America. With that cultivation and the choice of certain maize and bean plants that were cultivated, the cultivated weeds, early species of tomatoes, would have been unwittingly cultivated along with them. This may have led to the cultivation of that plant on its own on order to improve the fruit for those who started to eat this unknown plant. There is some genetic evidence that tomatoes were cultivated in order to produce fruit with smooth skin and with a taste that appealed to those who were growing them. By saving the seeds of the plants that produced a favorable taste, new plants could be grow that had this desired trait. Smoother-skinned varieties could be grown again and again, with the smoothest-skinned fruit seeds being saved in order to improve the skin over many generations. Tomatoes are a self-pollinating fruit, and the genetic offspring of a tomato plant will generally be the same as its parent. This can make it difficult to cultivate a new aspect within a tomato. When a slightly new characteristic does emerge it takes careful cultivation to create more plants that will steadily have this characteristic. Creating a new species of tomato could take hundreds of years, depending on how different the species was from the original. From cherry tomatoes to beafsteak tomatoes and from bright red fruit to orange, yellow and even striped tomatoes, there are many, many generations of cultivation that must take place. By the time the Spanish explorers arrived in the New World, tomatoes had already been cultivated in Central America for thousands of years. The new tomatoes being eaten in stews, salads and salsa were far different from the wild tomatoes that grew from the original seeds that made their way north. They were small, had smooth skin and were likely bright yellow in color. Tomato Popularity in Europe and the U.S.
With the introduction of tomatoes to Europe in the 16th century, there were mixed opinions about exactly what to do with it. Superstition and the state of herbal knowledge of the day led to many ideas about what it could and couldn’t be used for. The fruit was described in an Italian manuscript in 1544, where the fruit was named the pomi d’oro, or golden apple. The writer, Matthiolus, described the Italian taste for eating these yellow tomatoes with salt, pepper and oil. However, not all Europeans were interested in trying them. And early write-up in 1596 revealed that while some Britons were cultivating tomatoes, they were not interested in eating them. It was a crop that was raised purely as an ornamental plant in England because of the English distaste for the fruit. Despite the distaste than many felt for the fruit, as an ornamental plant they were being cultivated to create more colorful varieties. In 1623, there were a few separate species of tomato being grown, each a different color. Golden, yellow, red and orange tomatoes were described as being grown in Europe, though it’s possible that this represented only three different species. These colors were only the beginning. By 1700, there are seven types of tomatoes known to be in existence in Europe. The description of one, a large, red tomato, is described much like the modern tomato species that are mass produced for grocery store stock. As the centuries passed, the English became more accepting of tomatoes. During the mid 1700’s, some cooks were using small amounts of tomatoes to flavor their dishes. By 1758, there were recipes that used tomatoes, including one published in Hannah Glass’ book The Art of Cookery. By the 1800s, tomatoes were far more accepted in England and the fruit began to be grown and sold on a mass scale. Like the Europeans, many colonial Americans were suspicious of the tomato. While it made an attractive plant to grow outdoors, it was not at first used as food. Instead, it was often grow for use in folk medicine. When used topically on the skin, it was believed to heal pustules. The fear and suspicion of the tomato had many factors, at least one of which was justified by the Europeans. The tomato plants that were introduced into Europe resembled the well-known nightshade plant that was feared and reviled all over the continent. In addition to being poisonous, nightshade was believed to be used in spells cast by witches. The plants were also believed to be used to call the werewolves that roamed the countryside. The fear of the resemblance to nightshade plants was justified, as the tomato is a member of the nightshade family. Like European nightshade plants, the leaves and the roots of tomato plants are poisonous. Both contain solanine, a neurotoxin. Early experimentation with the leaves and roots of the plants and the resulting reactions may be behind the revulsion of the fruit that was prevalent in Northern Europe. In France, there were different feelings toward this new fruit. Tomatoes were called pomme d’amour, or, love apples. There are two possibilities for the origins of this nickname. The first is the widely-believed theory that the fruit was rumored in France to be an aphrodisiac. However, the name could be a simple mispronunciation of the Spanish name for tomatoes- pome dei Moro. There is a popular myth that the medieval Europeans believed tomatoes to be poisonous because its high acid content leeched lead from the pewter plates used during the age, but this is proved to be incorrect. According to the known history of the tomato, there were no tomatoes in Europe during the medieval period. Much of the early use of tomatoes in Europe was documented in Italy. The early yellow tomatoes that were eaten in the country were joined years later by red tomatoes that were introduced to Italians by Catholic priests. Italians did not share the fear of tomatoes that other Europeans did, and took to the fruit quickly. In Spain, the tomato was better received than in many European countries. The Spanish name for the fruit, the pome dei Moro, meant Moorish apple. During the 16th century, tomatoes were cultivated in Spain on a wide scale, and the fruit was gradually added into more and more native dishes. Today, tomatoes are the most popular food in Spain in terms of consumption amount. A modern popular Spanish festival of today is the annual tomato fight in Bunol. La Tomatina features 4000 tons of tomatoes and two teams of participants to throw them at each other. The early fear of the tomato in Colonial America persisted as long as the fear of witches. Thomas Jefferson was eating tomatoes in the late 1700’s, but he may have been in the minority. In Salem, a liberal town by the early 1800’s, the introduction of the fruit to the townspeople in 1802 was met with fear and suspicion. In some areas, however, people were losing their fear of this fruit. In New Orleans in the early 1800’s, the tomato was being integrated into the local spicy cuisine. In Boston, the fear of eating tomatoes was so pervasive that Colonel Robert Gibbon Johnson staged a demonstration of tomato eating in front of the local courthouse, according to a farm journal of the day. Locals turned out to watch the colonel eat a bushel of the fruit, believing that he would be poisoned and die. When he did not, the fruit began losing its stigma. One of the agricultural visionaries of the 1800s, George Washington Carver, advocated eating tomatoes for their nutritional benefit. By this time, the tomato was growing in popularity among Americans. During this century it became a commonly-grown item in home gardens, becoming a staple vegetable by the close of the century. With mass canning in the late 19th century, the appetite for tomatoes in America exploded. The fruit was used in more and more dishes and condiments as tomatoes became grown in larger and larger numbers. According to the CDC, Americans eat about 5 billion pounds of uncooked tomatoes each year. According to the USDA, there were 25.5 pounds of canned tomatoes available for each person in the U.S. that year. A USDA study in 2008 showed that the number of canned tomatoes that Americans consumed in 2005 was more than five times more than the second-most-popular canned produce item- canned sweet corn. Lizz Shepherd is a freelance writer and PR specialist and frequently writes about gardening.